The Babies Out West brochure provides information about services from pregnancy and childbirth to counselling and parenting education available in West Auckland. Brochures are distributed through Waitakere Hospital maternity, midwives, and Plunket, and also available at all health and social service organisations in the west and CABs, Libraries, GPs, kindergartens, day cares etc. 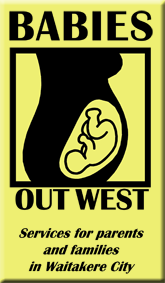 If you require copies of the Babies Out West brochure contact us or download your own copy by clicking on link below.